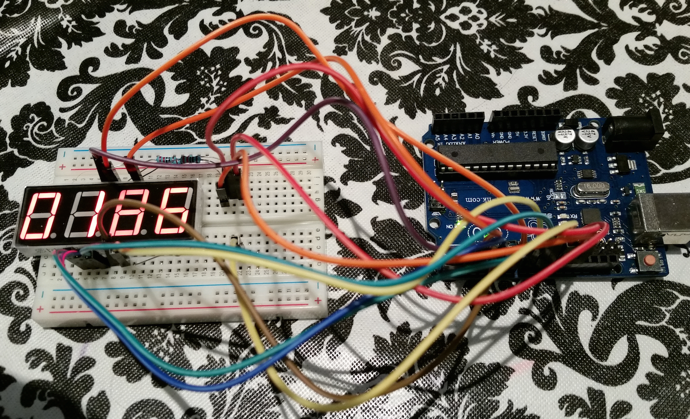 This entry was posted in Arduino, Software. Bookmark the permalink. you can post the code? 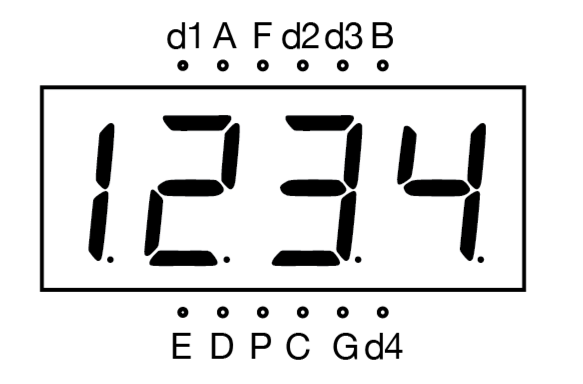 Thanks a lot for publishing this great description how to make the stopwatch run. The other stuff I found wasn’t useful. Thank you for your blog, which I found very helpful. I bought a Sunfounder Lab Started Basic Kit for Beginners – Ardruino Uno R3, on eBay. It included a little manual and small CD-ROM. I found the tiny print in the manual difficult to read, so I contacted them. They were were very helpful and sent me a PDF version which I find much more convenient. with all the pins labelled, however I found your ‘Pin Diagram for SMA420564’ more useful. 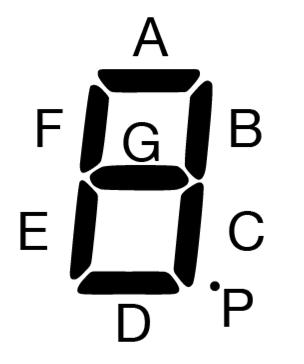 Regarding lesson 14 in my version of the manual, I learned from your blog: “The pins d1, d2, d3, and d4 correspond with each digit, with d1 being the first on the left.” However, I found your wiring schematic a bit disconcerting as my understanding is each segment should be protected by a current-limiting resistor. which seems to confirm that segments should be protected. Hence, I used 8 x 220 ohm resisters to protect the 7 segments, plus decimal point. to the Digital (PWM) pins 2-13 of the Adruino. it failed, apparently because ‘space’ is an illegal character. I renamed the folder TimerOne_Library. When I tried to import again, it failed and I ended up with a line called ‘examples’ in the list of libraries. Apparently it failed because I pointed at the contents, rather than the directory name itself. So, I tried again, finally TimerOne_Library appeared in the list of libraries. Then Sunfounder’s example sketch compiled without any errors. Finally, I uploaded it to my Uno and it ran first time. Success! Now I’m left with ‘examples’ in my list of Libraries and I naturally would like to know how to remove it.